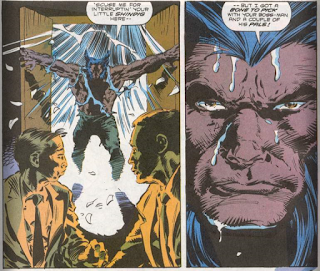 He and the animals make short work of Dai-Kumo's goons, and Wolverine chases Malheur into the drug processing facility, where the two fall into the chemical vat containing the drug. Wolverine emerges to find Goro waiting for him. Goro, who believes Wolverine, having risen from the grave, is prophesied to kill him, takes the Thunderbolt and attacks, but Wolverine simply slashes his legs and leaves. 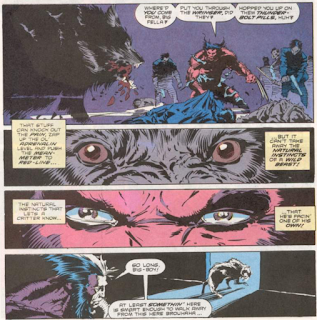 Returning to the party room, he finds Dai-Kumo dead, slain by Reiko, just as Tyger Tiger and Archie arrive, expecting to help Wolverine but finding him not in need of any. The three fly back to Madripoor, taking solace in the fact that at least Reiko was able to get out of a bad situation. The conclusion to Hama and Silvestri's first story arc marks the final appearances of most of the new characters involved in it: Dai-Kumo, Malheur, Reiko, Goro. 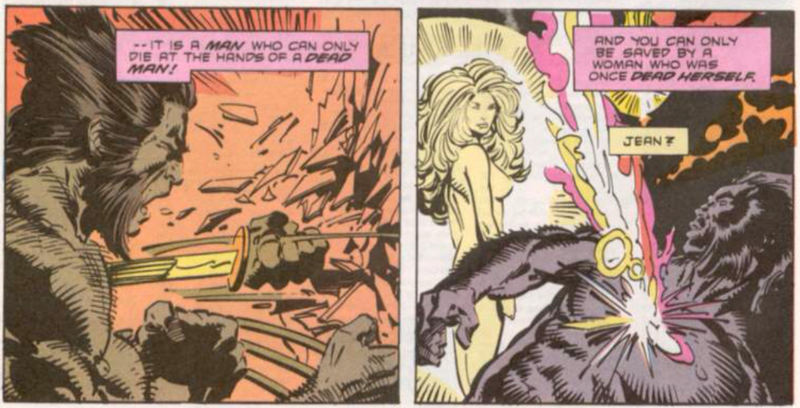 In yet another hallucination, Jean Grey pops up again briefly. Dai-Kumo goes into his whole spiel about how Raiden the Thunderbolt will kill its users, thus having the added benefit of ridding society of drug users, which seems like a bad business model, no matter how much he charges for the drug. As with the previous issue, this one contains another somewhat hamfisted PSA about drunk driving. 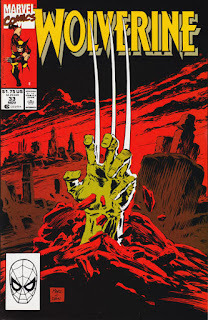 Silvestri turns in a pretty great image of Wolverine clawing himself up out of the grave. Wolverine does the old "stare down an wild animal by the sheer force of his own bestial nature" to a wolf that's been given the Thunderbolt. Hama & Silvestri's first arc comes to a close, on a macro level rather perfunctorily (Dai-Kumo is defeated and the Thunderbolt drug destroyed), but on the micro-level there's a couple of fun surprises in this one: first, the obvious setup of Tyger and Archie to come in at the last minute and help Wolverine turn the tide gets subverted, with the pair showing up just as Wolverine finishes taking down the bad guys. 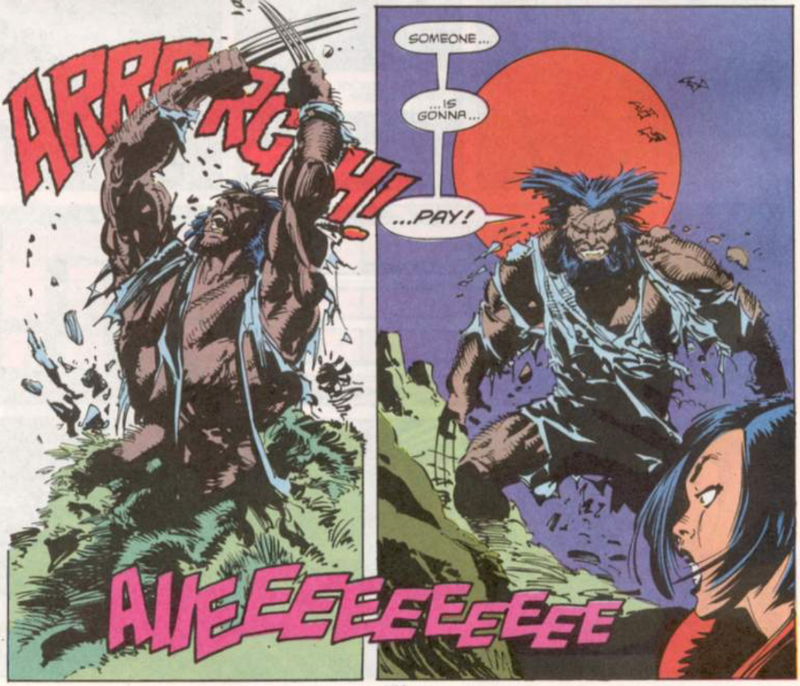 Secondly, the even more obvious setup of Wolverine slaying Goro, who believes he can only be killed by a dead man, gets sidestepped by Wolverine's nonchalance about the whole thing; he doesn't even care enough to kill Goro, someone who did his best to kill Wolverine (and believed he succeeded) twice, which is a pretty great piece of characterization on Hama's part. 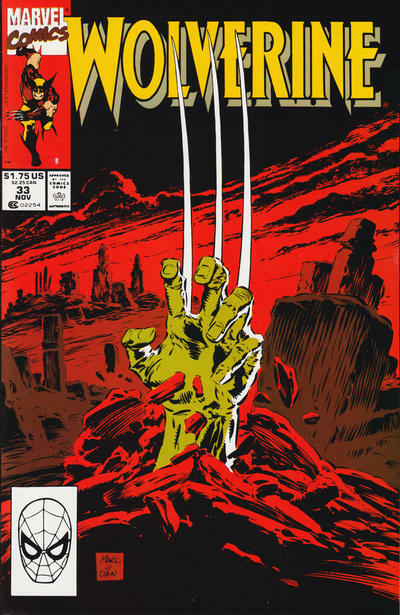 This story as a whole is unlikely to show up on anyone's "Best Wolverine Stories" list, as it's ultimately far too generic and repetitive - too many savage fights with faceless goons, too many loopy hallucinations (this issue squeezes in yet another) - but it is nonetheless an entertaining showcase for the new creative team. It doesn't shake-up the status quo nor take the title character in a bold new direction, but it does inject the series with a dose of much needed creative consistency, not just from knowing this team will be sticking around for awhile, but in maintaining a level of quality issue-to-issue across the three-part story. It may not be an all-time great, but it provides a solid foundation on which the new creative team can build. Next week: Uncanny X-Men #271, New Mutants #96 and X-Factor #61. I know the wolf is going to die soon anyway, but it’s quite possibly going to kill innocents before it does. Wolverine letting it go doesn’t sit right. His monologue would’ve been just as in-character lamenting that he had to put it down through no fault of its own. The recent done-in-one (written by Jo Duffy, I think) aside this stretch is the most enjoyable the series has been in a while even if, like you say, nothing great. 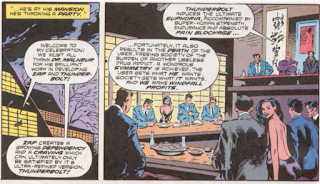 Despite some nice Byrne/Janson art the way-too-long Spore arc — which I just realized also had to do with superpower-granting narcotics — was too far afield of the book’s original milieu for my liking; ditto, to a lesser extent, the LA story. @Blam: His monologue would’ve been just as in-character lamenting that he had to put it down through no fault of its own. That's a good point. 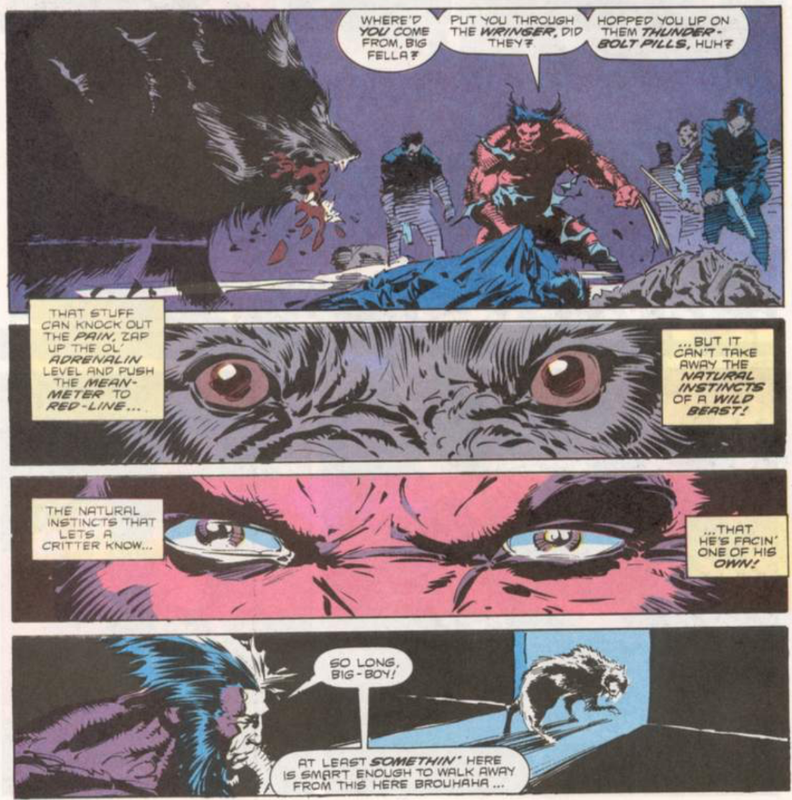 Maybe the idea is supposed to be that Wolverine has cowed the wolf into submission that he's just going off to die? Yeah, that Goodwin/Byrne story wasn't bad, but it definitely didn't fit with the focus of the book. This story gives us both consistent quality from the creative team while also still fitting in with the overall tone of the series. I love how this is 4 years before Mortal Kombat, and in one story there's a character named Goro and a drug called Raiden. Well I would debate that. It had a huge impact on me when I first read it in the late 90's when i was 10-12, cant really remember exactly when. I never read a comic as violent and brutal as this, and it blew my teeny tiny mind at the time. and then followed by non adjective Spiderman. Torment, Masks and Perceptions, blew my mind again. That's not to say that they were good they just blew my mind because they were so violent and so unlike any other comics I read before them. But this one was the first and as such it's memorable, to me at least.